On average, 100-150 elephants die every year in Sri Lanka due to intense human-elephant conflict. IEF is supporting efforts focusing on finding ways for people and elephants to co-exist. Any conservation strategy that has the potential to succeed must include efforts to bridge the gap between people and the wildlife with which they share their land, and through the participation and cooperation of the rural people whose lives it will invariably affect. This initiative consists of three projects involving conservation, human development, and economic development. 1) Erecting a solar-powered electric fence to resolve human-elephant conflict. Many attempts to fence elephants “in” national parks have failed. This project will fence elephants “out” of human settlements and areas of cultivation through the erection of solar-powered electric fences. The villagers will participate in all aspects of the electric fence assembly such as the construction of the 500 concrete posts and a control room to house the solar panels, energizer, batteries and switches, clearing the fence line, digging fence post holes, erecting fence posts and lines. Several villagers will undergo training to maintain, repair and operate the electric fence and the equipment needed to power the fence over the long term. The electric fence will immediately stop elephants from raiding village crops and as a result no elephants will be injured, harassed, or killed by the villagers. The fence will also stop the villagers from encroaching into elephant habitat, given that no villager will consider cultivating land outside of the fence. 2) Village field scouts program. Several villagers will be recruited and trained in tracking, monitoring, observing and recording elephant behavior establishing a database on the elephants in the region. A community-based ecotourism venture will provide opportunity for these field scouts to earn a living by guiding tourists to observe elephants and other wildlife. The field scouts will also eventually conduct environmental awareness programs in the village communities in the region. Through these efforts the field scouts will educate the rural villagers and develop their support for the elephant. As the data from the Field Scouts is analyzed, it will be possible to get a better understanding of the ranging patterns of the elephants in the area. This will help to identify the best areas to erect observation platforms for tourists, such as near feeding stations and mineral licks. The project will identify several homeowners that can offer their facilities for tourists to stay over night and experience village life along with their treks to observe wildlife. The project will also establish a central hub in the village from which the tourism program will be administered and managed. It is anticipated the villagers will see the economic benefits of the nature tourism project and will then stop their extractive and consumptive use of the forest, as well as halt illegal activities such as logging, gem mining and poaching. Additional objectives for 2004 include obtaining ecological data to develop a baseline on the local elephant populations at the project site in Wasgamuwa; to ascertain elephant numbers, herd composition, feeding habits (including patterns in crop raiding), and annual ranging behaviors. Seven youth from the Wasgamuwa area have been selected and trained to record direct and non-direct elephant observations, participate in dung counts and dung analysis, conduct human-elephant conflict surveys including crop and property damage, perform line transect studies, and use GPS to coordinate all field observations and identify the areas extensively used by the elephants in this region. Long-term solutions for elephant management will be developed with a better understanding of the biology and ecology of the elephants. Sri Lanka has globally significant biodiversity that is currently threatened by deforestation, land degradation, and unregulated exploitation of natural resources. According to estimates, the 8,220 square kilometers of protected area can support only 1600 elephants which is about 50% of the estimated population of wild elephants. 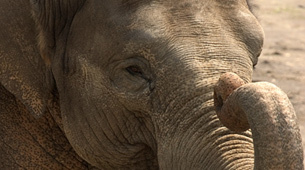 The remaining elephants need land outside of the protected areas for their survival. Thus setting aside enough habitat to support a large population of elephants will depend on the tolerance of the people who will need to share their land. People will tolerate elephants in their backyards only if they can benefit from their presence, are adequately compensated for their losses, and are provided protection from the frequent elephant attacks on their crops, property and lives. The objectives of the project, are to develop solutions at the community level to reduce conflict through a better understanding of elephant ecology, biology, human needs, and elephant management technology. Specifically, this project will erect a 15 kilometer solar-powered electric fence to protect homes and fields in four villages: Pansal Godaha, Parana Lahugala, Nawa Lahugala and Dewalagodaha situated along the southern boundary of the Lahugala Kitulana National Park from raiding wild elephants. This will also facilitate the establishment of a critical elephant corridor connecting the Yala National Park to the Lahugala Kitulana National Park. Subsequent monitoring of the effectiveness of the fence and the patterns of human-elephant conflict will be integrated into a paying volunteer program to make it sustainable over the long term. Developing a Sustainable Research Project for the Conservation of Elephants Integrated with the Restoration and Conservation of the Historic Somawathiya Chaitiya Temple Sustained by a Paying Volunteer Program (initiated 2006). This phase of this long-term IEF supported elephant conservation program focuses on the development of an integrative project for elephants/culture/nature conservation that takes into consideration the historic importance of the Somawathie Chaitiya Temple, which is nearly 2,100 years old. The Somawathiya Chaitiya National Park (SCNP) is situated in the North Central Province of Sri Lanka and is contiguous with the Flood Plains and Wasgamuwa National Parks to the south, and with the Trikonamadu Nature Reserve to the east, and the western side of the park provides a link to the Hurulu Forest Reserve, part of which is protected as a biosphere reserve. The area gets its name from the historic Buddhist temple – the Somawathie Chaitiya that is recorded to be 2,100 years old. The SCNP is 37,762 hectares and affords protection to a unique diversity of habitats consisting of riverine villus (natural water bodies) and flood plains, as well as to the largest concentration of elephants in Sri Lanka. The crucial components of the project will be to develop a partnership with the temple to help in its restoration, conduct an archeological dig in coordination with the Archeological Department and to initiate an elephant research and conservation program. It will also help to design new buildings that will reflect the historic time period as well as blend in with the natural environment. Due to the large number of elephants present, a solar powered electric fence to protect the human use areas without disrupting the natural wanderings of the elephants will have to be provided. It is also important to establish a project base in the temple premises to administer and manage the project and later to operate the paying volunteer program. By working in partnership with the temple to make sure the development plans for the temple do not conflict with the ecological needs and behavior of elephants and other wildlife in the area, the temple will provide access to a protected area that has been abandoned for 18 years due to past civil conflict. The conservation benefits to other the wildlife and flora will be far reaching since the park is rich in biodiversity. Most importantly this project offers an opportunity to develop a long-term plan for the conservation of the elephant by establishing innovative programs in an area that has a low human density and human-elephant conflict. This project could be a benchmark for conservation efforts being applied in an area before the usual processes that lead to problems for both humans and elephants.